Take a look at what some of our customers have to say about us. If you are interested in just reviews for our bike leashes, Click Here. - Check out some of our Shopper Approved ratings from verified customers. For a full list of reviews, click the icon above. "Hello Scott, I purchased both of these dog coats (CloudChaser and EzyDog Mission Coat) for several reasons. I wasn't sure which one I liked. I wasn't sure about the size. I wanted to save on shipping. Both coats arrived amazingly fast. I LOVED both of them. The size is perfect and quality outstanding. I would absolutely love an open-box item (IF you happen to have a 2012 WalkyDog model). Otherwise, sending everything else tomorrow and waiting on the backorder would be wonderful, too! We are all so excited to try out the new �toys� we have ordered! Body: Transaction was handled in a very fast, courteous manner. Will definitely recommend them to friends as well as buy from them again. Body: Very good service. I had a problem with the product, they took care of it right away, no questions, no problems. The way it should be. Other company's could learn from these guys. Body: This was an easy place to get what I needed and they really emphasize their customer service. I would definitely recommend "The Dog Outdoors". Body: Everything was great except for viewing updates through the website. You had to have the email and it would be nice to go through the website to know the status of the purchase/delivery. Body: Excellent Knowledgeable and careful about the products they sell. Body: I received the dog tow leash pretty fast. The instructinos on the product itself are way too tiny, but the videos on the site and the site of the creator are very helpful. My only complaint is that "the Dog Outdoors" does not offer the 3 color ooptions available on the creator's site. However, I chose t order here because I was more comfortable with their satisfaction guarantee. I love the product - my dog is probably the best testimony you can get. I own an almost 100 lb GSD and she can be very hyper. She is also EXTREMELY strong, even for her breed. She has lunged several times at other dogs, and has yet to unseat myself or my husband from the bicycle (or even come close for that matter). My only complaint about the product is that the connection at the frame is a little too flexible. There have been a few times when I have stopped the bike that my dog has been able to get herself on the right-hand side (she jumps and gets over to the right and it is hard to get her back). As I said, she is very hyper. I think if the product were a bit stiffer at this junction, it would prohibit so much flesibility in the "leash" itself. However, she has not done this while we were in motion, as it is harder for her and the pressure from the stiffness of the leash really encourages the dog to keep moving with you. If you have a large dog, be prepared that they can, in fact, stop the bike even though tipping it over seems nigh impossible. For example, when we are riding in the desert, if my dog decides she has to go to the bathroom, she simply applies her brakes and the bike begins slowing rapidly. A glance back to her tells me why, and I stop. there is no way you are going to stop this with a large dog. However, it does not cause instability in the bike itself - it simply forces you to stop. I don't think you can beat this product for riding a bike with any dog. I believe it is the best and, most importantly, safest device available. Body: Fantastic service - rushed my order out at the end of the day to get delivery before heading out on my vacation. Videos of products and in action are really great. 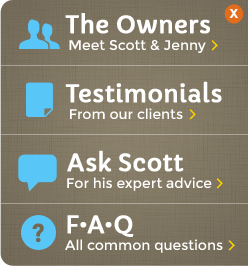 Scott adn family seem to be real people doing business in a unique and customer friendly manner with value added. Body: Excellent product, service and price. We couldn't be happier with our purchase! Body: I'm a big fan of The Dog Outdoors. They respond quickly to questions through email. They seem to really care about dogs. And they seem to test out all they sell. I also really like their video tutorials! I would definitely buy from them again! Body: Great My only complaint is the cost of shipping....maybe out of the DogOutdoors hands....Throughout the year I may want to order several items but, because of shipping costs, I have to wait and place one order rather than several throughout the year. The shipping costs can easily double my order costs...Other than that..love the product...great service! Body: Great Great service-great product! Body: Great products. Good prices. Very fast shipping. I am very satisfied and I WILL buy from them again. Body: Customer service is especially great. I will continue to do business with them because I know when I have a problem, they will take care of it. Body: This merchant cares about their products and the customers who use them and it shows in their communications and actions. If only everyone did business this way! Body: Love the videos explaining the merchandise, made it easier for me to choose the right products for me. When I recieved the products (shipping was fast) they were exactly as described and quality is top notch. I will be back to this site whenever I need to make a purchase for me and my dog. I have also been telling my fellow dog lovers about this site. Body: We have been using the Easy Dog harness for a few weeks (daily) and prefer it to our other models. Tami like to explore the brushy side-trails and the harness doesn't attract fox-tails. She is a strong puller and I like the performance of the harness. Body: I changed my order at the last minute, and they were able to help me out and still get the whole order sent out. The walky dog is great, I didn't think anything could make my dog tired & this does. Body: Quality products. I purchased the vari leash and mongrel leash. My wife and I love them. It was very easy ordering everything online. Everything came within a week. I am very happy with these guys. Keep it up! Body: This was my easiest and smoothest online purchase ever! Body: I have had a few great transactions with thedogoutdoors. They are very prompt and friendly. They care about what they sell because they use the products themselves. This is the way it should be done. I wish everyone followed their example. Body: Great Product - just as described. Fast shipping. I would definitely buy from The Dog Outdoors again! Body: We love the Dog Outdoors. Great products, good prices. I never thought I would be able to ride my bike with my dog, but now we do it daily, thanks to the Dog Outdoors! Body: Got the item with no problems. Body: Great product for a great price. Fast shipping. No complaints. Body: Everything went really well. The merchandise is very excellent quality. My order was shipped in a timely manner. I have no complaints. The Dog Outdoors is an excellant company. I would definitely order from this company again. Body: Very good order experience from an extremely knowledgeable vendor; they only sell what they use. I would highly recommend them for dog owners looking for high quality, unique items for the active dog. Body: Followed measuring guides & received item as stated. Body: My shopping experience with the dog outdoors was excellent. I had a question about an item and TDO replied to my email quickly and gave me terrific customer service. TDO has a lot of info about thier products, plus instructional videos on how to use their products. Overall TDO gets a 10 plus rating. Body: Great personal service. Love the review videos. Fast delivery - faster than a lot of bigger operations. I have a lot more confidence in my purchase feeling like I know the people I am buying from a little bit (as opposed to a faceless corporation), and knowing that they have tested the products on their own dogs. Both items I purchased have worked out great - exactly as advertised. Body: I was worried about my VERY strong lab pulling me over on my bike, but the Walky-Dog bike attachment is a HUGE improvement over holding the leash! My dog tried to chase a cat this morning and she did not pull me down like she would have without the Walky-Dog. I decided to buy from your store because you had such informative videos and information. Body: Very helpful seller. I had questions and they were answered promptly prior to my purchase. My items were exactly as described and very well made. You may find knock-off's for less money but they surely will not have the quality that The Dog Outdoors stands behind. I'll happily be back. Body: The videos and descriptions are a great help and the shipping was very fast. We're very happy that we found The Dog Outdoors! Body: My purchase even came with a free doggie biscuit and a personalized thank you note! In the end, I decided to purchase my items (dog harness, lead, and collar light) from "The Dog Outdoors" because of their online videos demonstrating the use of their products on an actual dog. I also felt a sense of security buying through their website. Not to mention, I knew exactly what I was purchasing as a result of the videos. Thank you!! Body: I LOVE the Bike Tow Leash I bought - it has been a big solution to a big problem I had in getting the energy out of my strong dog who likes to chase cats. It's been life-changing for both me and my dog; I don't think I'll take an more falls with resulting road rash and black eyes. :) I've been telling my friends; it's so great! They were quick to deliver, and the videos on their site were super-helpful to learn more about the product. Body: These folks are great!!! Thanks, Scott for all your help! Body: I was so pleased with my purchase - they even put doggy bones with bows in the package! I got the EZDOG mongrel leash with two bungee leash extensions for by two labs. I can now walk them with one hand and they immediately stop pulling as soon as they feel the tension on the bungee. I could not be happier. The Dog Outdoors will now be the first place I look for unique and well made items for my dogs. The shipping was fast and well priced compared to other sites I have been to. you can tell that they put a lot of thought and test all of the products that they sell. Body: Good product, good price. Thanks. :O) 2 woofs and a milkbone!! Body: This is a great website for outdoor dog products. They use the products with their own dog and post informative details. They also use video to give useful information. Great customer service! Body: Wonderful company with genuine concern for canine care and safety. Fast shipment. Quality product.